TruCare Mobile provides access to a subset of data that is most important to care managers who work in the field. Care managers are mobile and they need technology that fits their workflow. TruCare Mobile enables care managers who work in the field to be highly efficient even when they don’t have access to the internet. Casenet®, LLC today announced the launch of TruCare Mobile, a native iOS app for the iPad that provides online and offline access to TruCare, Casenet’s population health platform. The app was developed for care managers who experience intermittent internet access when working with members in their homes or other care settings. TruCare Mobile provides access to a subset of data that is most important to care managers who work in the field. 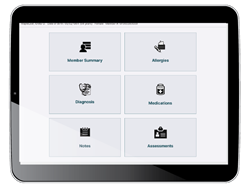 Users can view and update demographic information, assessments, member summaries, allergies, diagnoses, medications, and notes in both the offline and online modes. Users can also view information about authorizations including the requesting provider, the dates the member was admitted and discharged, and the status of the authorization. Changes made to the member record in the offline mode of TruCare Mobile are reflected once the user is online. Casenet’s team of experts in human-centered design developed the TruCare Mobile app based on direct feedback from TruCare users. The App has an intuitive UI design and functionality that users have come to expect from mobile Apps including easy toggling between online and offline modes and the ability to sync data with the desktop version of TruCare. TruCare Mobile is available from the Apple App Store. Casenet provides a comprehensive suite of enterprise care management software and services solutions for commercial, Medicaid, Medicare, TPA, provider/ACO and specialty provider organizations that have multiple lines of business and that require comprehensive configurations for each member population. Healthcare organizations rely on Casenet’s population health management solutions to improve care coordination and the quality and delivery of care through enhanced case, disease, utilization, and home and community-based services management. Casenet solutions enable organizations to adapt quickly to changing market and regulatory dynamics, and to identify and target populations having unique risk characteristics with specific care management programs— taking the first step toward better individual health and total population health management. For more information, visit http://www.casenetllc.com.